We look at Curses ‘n Chaos, which blends frantic action with 8 bit visuals and a tiny bit of tower defense. Curses ‘n Chaos is another retro-inspired indie title for the Vita, but plays unlike any of the games back in the 8-bit days it mimics so well. It’s fast, it’s frantic and it’s tough as nails. It also has a back story, involving the two player characters Lea and Leo and their need to create an elixir in order to lift the evil Wizard’s spell, but the story is rather generic and only really serves as a reason to dish out lots and lots of violence – just like pretty much every back story to 8 and 16 bit games. In Curses ‘n Chaos, the story only serves as your reason as to why you have to defeat wave after wave of enemies – it’s your only way of acquiring the necessary ingredients for your elixir. The wave system is actually something that reminded us of the tower defense genre: each stage is divided up into ten waves of enemies and also includes a boss fight, with every wave becoming a bit more challenging. The actual gameplay, however, has very little to do with tower defense. 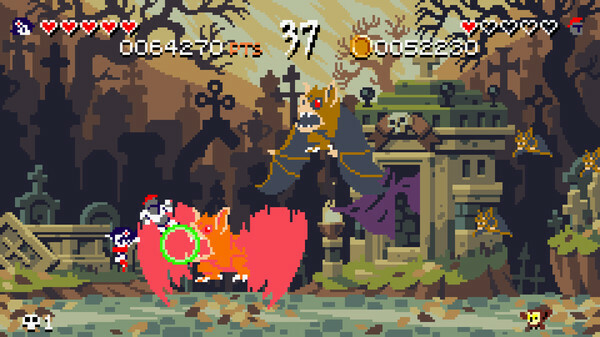 In Curses ‘n Chaos, you’re engaged in a flash version of a royal rumble where you have to defeat all the enemies you encounter within sixty seconds – or risk facing the grim reaper who will strike you down instantly. This sounds challenging enough as it is, but matters are complicated further by the fact that you only have three lives available to you for a stage, and if you run out you’ll have to start over from wave number one in that stage. There’s an arcade-like quality to the action, which seems like it’s set up so you can’t easily get very far, but you still have that “one more try”-feeling. Most of the time at least, because this is a very, very challenging game that can get very close to frustrating the player at times. This is, for a large part, due to the hectic nature of the battles, where there is time pressure in addition to the danger that the enemies themselves pose. You’ll quickly find yourself kicking and punching all around in an attempt to get the upper hand, but doing so might also make you miss the movement patterns that would have otherwise been the key to victory. This makes Curses ‘n Chaos an interesting new addition to the Vita catalogue. It’s challenging, maybe even to a fault, but eventually beating that steep learning curve feels pretty good indeed.